Second publication (2011): A new view on Dark Energy and the expansion of the universe. Upcoming: Third publication (Autumn 2019): Fourth Law of Thermodynamics to explain the “Delayed Choice Quantum Eraser effect”. Summer 2017 Quantum physics is from now on a research topic that Head Biotech has found new interest in. This because the bizarre findings, related to the effects of human observation, found in the famous “Double-slit experiment” can help support Head Biotech’s version of Fourth Law of Thermodynamics – and vice versa. Head Biotech’s version of Fourth Law of Thermodynamics can explain the strange behaviours that are observed in the “Double-slit experiment”. If there exist a universal law, as described in Fourth Law of Thermodynamics, the conscious and unconscious mind should affect the universal energy state at an instant – this should also be the case as the brain intertangels the quantum world in the double-slit experiment. The universe do detect changes in the universal energy state at an instant (Eg how the universe governs all molecules conformations in the entire universe at once), and thus effect moves through the universe faster than the speed of light. Such an instant universal detection in energy states, connected to the quantum world via the human mind, could very cause the disturbance found in the particle/wave-form in the quantum world (the bizarre effect observed in the double slit experiment). The instant universal detection of a change in energy state stemming from the quantum observation will travel faster than the speed of light, and thus explain the extreme bizarre behaviour in the Delayed Choice Quantum Eraser effect. I guess the point here is that The Fourth Law of Thermodynamics predicts how the universe are able to detect truth in a social game using this same phenomena found in quantum physics. That is, you can’t fool the universe concerning the true motivation behind an act (lying) because the truth behind the motivation is directly affecting the universal energy state, Eu (as is described on page 12 in Hypothesis: Fourth law of thermodynamics) and could potentially be registered/detected by the universe – via its effect on the universes energy state. Summer 2015 A document for norwegian speaking investors has been created. Click the link Forklaring Til Investorer in the menu bar. In this document I explain in my native language (Norwegian) what Head Biotech is all about in three steps. English investors can click the Explanation To Investors youtube-link in the menu bar. Head Biotech’s version of Fourth Law of Thermodynamics is recognized by Hmolpedia. Today Hmolpedia has recognized 6 other versions of the Fourth law of thermodynamics. I was always hoping to tell Nash about my discovery. 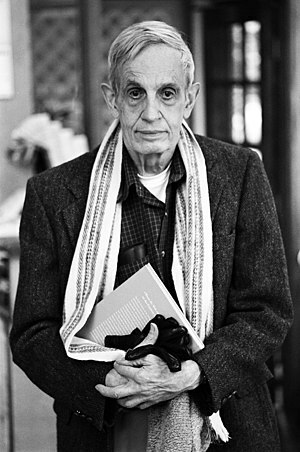 However, waking up on my 40’th birthday I learned that John F. Nash tragically had died in a car accident the evening before along with his wife. The couple drove home from the airport – arriving from a trip to Oslo, Norway. Since he has meant so much to me it became a very special 40’th birthday-morning. RIP. Screenshot from The New York Times under (24.05.2015). Spring 2014 Head Biotech is delighted to report that one of the worlds biggest expert on Nash equilibrium, the scientific author and the former editor in Chief of Science News , Tom Siegfried, shares Head Biotech’s view on Nash equilibrium. That is, the part on how Nash equilibrium can be related to energy states, as described in Head Biotech’s Fourth law of thermodynamics. Siegfried is the author of the book A Beautiful Math: John Nash, Game Theory, and the Modern Quest for a Code of Nature. This support is very important to Head Biotech’s credibility, because it is a crucial one when interpreting Nash Equilibrium in favor of Fourth Law of Thermodynamics. “ Now, if you put a chemical reaction inside a closed system that experiences various energy contexts (varying temperatures), that chemical reactions equilibrium point will move in response to the varying energy context. According to Head Biotech, the same principal will take place in a social biologic game. Nash’es equilibrium point for a social game, in which the game is the struggle for survival, will change its potency in a similar manner in response to various thermodynamic contexts. However, so far in evolution Nash’s equilibrium point has been somewhat stable, as the thermodynamic context in nature has been stable as well. That is, the thermodynamic context has been balanced by the natural dynamics that take place in the ratio (nr. 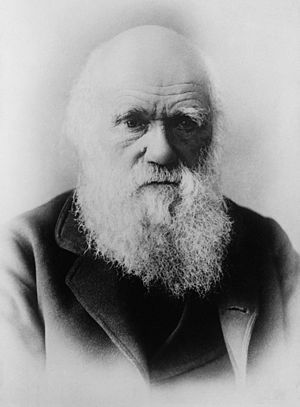 of individuals)/(available food (energy)) in which principle Darwin said “Drove evolution forward”. As the available energy to a population has increased in nature, so has the number of individuals in that system. In contrast, as the available energy has decreased, the number of individuals in that system has decreased accordingly. In this manner has life fluctuated back and forth, over the course of evolution, for 4 billion years. This natural fluctuation in energy contex has created an energy context for evolving life in which we can phrase too-little-energy (on the whole). Therefore, so far in evolution life has not experienced huge variations in thermodynamic contexts other than these fluctuations (the result can e.g. be seen in ducks Nash equilibrium example on Ducks). This, until recent times in the modern western world (due to birth control, industrialisation of food production etc). Head Biotech uses governments in rich countries, which are based on high tax rates, as an example of a closed system in which the thermodynamic context gets extreme for a social game – over long periods of time. According to Head Biotech’s theory, the Nash equilibrium point can under such extreme thermodynamic contexts move away from what nature is used to and thereby move, and hence weaken, the natural Nash equilibrium’s potency (its degree of fitness in the struggle for survival under normal circiumstances). The new phenotypes that would thrive and be given fitness (phenotypes that now will best reach the new Nash equilibrium strategic solution) in response to this new thermodynamic context, should according to Head Biotech be more evil phenotypes. This is because Head Biotech suggest that energy context in it self is the PRIME MOVER in how nature is handing out fitness to evil, or good, phenotypes respectively – which again will control what phenotypes are produced and accumulated in that system. That is, the context too-little-energy is the prime mover in keeping evil phenotypes from becoming fit in the struggle for survival – and that this is a natural law that is working wherever life exists in the universal system. Hence, the new governmental system described above should for the first time in evolution start giving evil phenotypes more fitness compared to good phenotypes, and therebye start to accumulate evil phenotypes. Basically because evil phenotypes are believed to consume more energy from the universal system, compared to good phenotypes, it will gain fitness in a system that experiences constant abundance of energy. According to the theory, the very thing, or the prime mover, in what hinders evil phenotypes from being given fitness over good phenotypes (too-little-energy) has now been removed for that closed system. By this, a connection is made between the physical world of thermodynamics and the biological phenotypes; Evil and Good phenotypes. The suggested universal Eu -> 0 -> Paradise law, will no longer be able to sense and therebye remove evil phenotypes from such a closed governmental system – since Nash’es equilibrium point now has lost its potency. Hence, the slow – but steady production of loving phenotypes seen in nature so far, should in the new thermodynamic context described above be reversed (production and accumulation of evil phenotypes) from what nature is used to. Head Biotech is here to warn about such a development on our planet. In conclusion, the universe with the universal thermodynamic context set to Eu -> 0 (too-little-energy) is the prime mover in producing good phenotypes. Nash equilibrium really just describes and tells us what the equilibrium point (maximal fitness point) in a social game is, IF the social game takes place in a system that constantly seeks its lowest energy state (free competition). The hidden equilibrium point (impossible for us to calculate) in a very chaotic social game will always be stable in theory, but will change its potency, as the thermodynamic context changes. In a way, Nash equilibrium describes Head Biotech’s law, Eu -> 0 -> Paradise, mathematically. A universal law that are meant to hinder evil phenotypes to accumulate in life – eventually governed by how the universe is created from the very beginning – as a place with a limited amount of mass/energy. See also Nash equilibrium example on Ducks. What we now need to put the “Paradise” phrase in the formula Eu -> 0 -> Paradise is a “God” that created our universal system in which the dynamics at the microscale discussed over works. If a “God” created the universe there should be a plan at the macro scale for this pattern at the micro scale. A plan that would give a perfect end-result of the mentioned irreversible process at the microscale, Eu -> 0 -> Paradise. This perfect end-result should naturally be, Eu = 0 = Paradise, and continue to rest in this Paradise state (the universal ground state) forever and after. Summer 2012 Noticed what Jesus said in the bible verse: Mark 9:46. The story about Jesus, and exactly what he said, has been in the hands of a small group of people before the bible reached the public around 1450-1500. If Jesus talked about taxes/money/food relative to evil/good phenotypes, similar to as what Fourth Law of Thermodynamics does, it is very likely that these parts have been removed/altered from the bible (as the bible was under these tax-institutions control for centuries). In that case, what would be left in the bible on these topics should today appear merely as unidentifiable fractions, or survived as cryptic writings (to hide the original message from destruction). For example, the way Jesus describes hell in Markus 9:46 (see picture). It is a cryptic way of expressing “Eu = 0 = Paradise” without mentioning money or food. At the same time it is also an extremely precise way of expressing Eu = 0 = Paradise. The worm-part must be included, this to emphasize that eternal fire is not meant to be understood as a physical flame, but rather to describe a termodynamic context (energy in the form of e.g. money and food) in which evil phenotypes gains fitness in nature (Eu = ∞). The principle in Markus 9:46 is exactly the same as described in Eu = 0 = Paradise, but turned upside down (which by the way should not go to completion due to the 2 Law of Thermodynamics). Anyway, the main point is that energy context is playing the prime mover in the handing out of fitness, to evil or good phenotypes, respectively. What Head Biotech has added to this is of course that a change in energy context concurrently changes the potency to Nash’es equilibrium point, and thereby which phenotypes are needed to reach the movable Nash equilibrium point (example on Ducks: https://headbiotech.wordpress.com/nash-equilibrium-example…/). May Gods peace be upon him. *Paradise = A technical term that describes a universal state of 100% love_and_intelligence. That is, the full potential to all of the mass/energy in the universe according to the Eu -> 0 -> love_and_intelligence transformation logic that is propelled by life itself. ** All of Head Biotech’s activities are governed by Sponbergs version of Fourth law of thermodynamics (Eu -> 0 -> Paradise). Head Biotech was founded by Bjorn Sponberg in 2009. He holds two master degrees, one in Molecular medicine (NTNU, 2009) and one in Bioinformatics (SU, 2012). See more under CONTACT INFO in the menu. Eu = Energy in the universe (potential + kinetic energy). Eu -> 0 = Second law of thermodynamics (universe must seek its lowest energy state because it has been created with a limited amount of mass/energy). Background picture: Ants construct a living bridge (wordlesstech.com). Head Biotech suggests that it has always existed a hidden Nash equilibrium point in free competition (Nash equilibrium). By applying empirical data from nature, such as the behavior of ants, Head Biotech tries to confirm that a hidden Nash equilibrium in free competition has governed true solidarity to accumulates over greed in nature. According to Sponberg this hidden Nash equilibrium point should lose its effect when energy states becomes irrelevant in the struggle for survival (competition takes place in a system that experiences constant abundance of energy (constantly-too-much-energy). As ants have not experienced a competitive context other than chaos and free competition, they should neither have developed evil phenotypes. Hence they are Head Biotechs favorite model organism. The first ideas that later shaped Fourth law of thermodynamics, began in 2005 (Figure 1b). The major step stone, the expression Eu = 0 = Paradise, was later established via philosophy in 2006. It only describes how the universe will end and links its destiny to lifes destiny. In 2009 the theory was completed by applying the hidden Nash equilibrium to the theory. This to describe mathematically what takes place during the biological process; Eu -> 0 -> Paradise leading to the ultimate goal; Eu = 0 = Paradise. According to Head Biotech, Nash equilibrium describes the dynamics that links universal physics to life. The Second Law of Thermodynamics (Eu -> 0) creates the hidden Nash equilibrium (called fitness) in life’s struggle for survival due to the thermodynamic context it has created in nature. Nash’es equilibrium point in free competition is believed to be rewarded by nature due to how the solution(s) lower the universal energy state – relative to its ultimate goal; Eu = 0. For life to be given fitness in nature, it needs to get closer to the hidden equilibrium point compared to its competitors. This continuous search towards the hidden Nash equilibrium point (hidden because in very complex situations we can not calculate it anymore but it must exist) will now be a continuous search towards 1. Lowest universal energy state (Eu) AND 2. The most loving phenotypes from the competitors available. According to Head Biotech’s theory the hidden Nash equilibrium in life links thermodynamics with the phenotypes love and evil in life. Because to get closer to the hidden equilibrium point life must demonstrate more loving phenotypes relative to its competitors – in order to be given fitness by nature. In contrast, evil phenotypes will represent the alternative solutions which mathematically places them further away from the hidden Nash equilibrium point as a strategy for survival. By observing the empirical data available in nature we can see that evil phenotypes have not accumulated in nature, but rather good phenotypes have. According to Sponberg the only way to escape his law (Eu -> 0 -> Paradise) is to change the thermodynamic context in which life competes (the prime mover – figure 1a), in order to weaken the hidden Nash equilibrium point’s potency in the selection process (change what are given fitness in nature). That is, to change the energy context from the universal Eu -> 0, to the unnatural Eu -> ∞ (constantly too-much-energy). Hence, after the hidden Nash equilibrium point is removed (weakened) by reversing the energy context, evil phenotypes are no longer hindered to be given fitness in the struggle for survival. This since Nash’es hidden equilibrium point now becomes irrelevant in a system that do not constantly search for its lowest possible energy state (E -> 0). Modern biologic sub-systems have been able to reverse its competitive energy context by being allowed to create tax based governments. Life on earth has never seen this competing energy-context before. Hence, according to Head Biotech the very reason to why evil phenotypes have been held down in nature has recently been removed and must be stopped. As an impact investor you can via Head Biotech contribute to hinder life from accumulating evil phenotypes in the future first by creating awareness. In addition, you could also help accelerate the universal struggle towards locating the lowest possible energy state (Eu = 0), as described in the expression Eu = 0 = Paradise. Figure 1a. Prime mover in the development of evil phenotypes in biology is predicted to be energy context at the physical level. Hence, the regulation of evil and good phenotypes in nature is connected to termodynamics functioning as the prime mover. Figure 1b. This graph from 2005 was the first work that later led to the fully developed theory Eu -> 0 -> Paradise in 2009. The graph from 2005 illustrate the predicted production rate to love-and-intelligence for life in the course of evolution. I had not yet related the theory to energy states, just that the production of intelligence would grow exponentially in the future. Added to the theory in 2006 was that the absolute lowest universal energy state could be described as “Paradise” and the expression Eu = 0 = Paradise was born. In 2009 the theory was completed by adding Nash equilibrium to the theory. It placed Nash equilibrium into the theory to explain mathematically what took place in the irreversible Eu -> 0 -> Paradise process. Nash equilibrium is integrated into the formula. One can say that “the game” stops at Eu = 0 which by this would be the universes ultimate Nash equilibrium point. All other solutions prior to this must relate to Eu = 0 and hence makes the universal irreversible reaction Eu -> 0 -> Paradise come alive. Everything is driven by the second law of thermodynamics which stems from the fact that the universe is created as a place with limited energy. In 2011, “A new view on dark energy..” came to life, it predicts that the lifeforms in the exponential part of the graph could be the cause behind dark energy. It’s a long-shot compared to the basics in Fourth law of thermodynamics, but the expected mass/energy -> love-and-intelligence conversion rates in these higher evolved life forms are reminiscent that of dark energy. In that case we are watching the effects of Eu -> 0 -> Paradise unfolding via higher evolved lifeforms, when we observe the exponential expansion of the universe (see more in paragraph 1.2). This must mean that First Law of Thermodynamics (Law of energy/mass conservation) can not be universal, but only yield where life do not exist, or where life has not yet reached the exponential conversion rates shown in the graph (as here on earth). Love-and-intelligence will now be a third form in addition to mass and energy. On that note, it is interesting to learn that astronomers led by Dr. István Szapudi of the Institute for Astronomy at the University of Hawaii at Manoa have discovered that there is an extremely rare large-scale structure in the mass distribution of the universe. In the oldest part of the universe there are huge areas of space that are of lesser density and energy, a so called gigantic “cold spot”. This is interesting to Head Biotech, because such a pattern is exactly what would be expected from Fourth law of Thermodynamics. This since, the mass/energy consumption should be exponential in the oldest parts of the universe where the first life forms evolved. These lifeforms should have been the first lifeforms that reached the exponential mass/energy -> Love/Intelligence conversion rates shown in figure 1b and Figure 3. Figure 2. Fourth law of thermodynamics is inspired by Nash (bottom), Darwin (top left) and Newton‘s (top right) work. 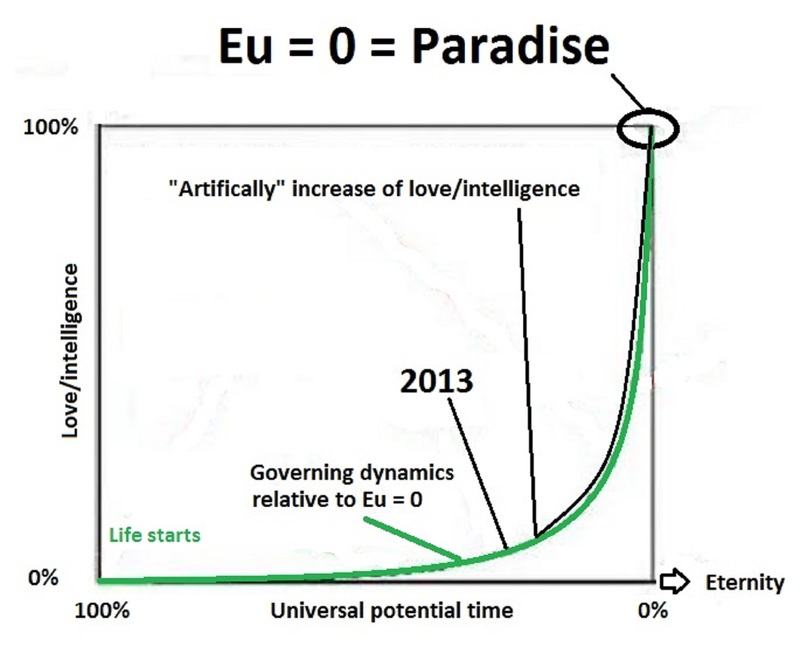 1) Eu -> 0 -> Paradise and universal expansion shares the exponential speed rate that is expected from higher evolved lifeforms in the irreversible Eu -> 0 -> Paradise process (figure 3). 2) Higher evolved lifeforms in Eu -> 0 -> Paradise should affect mass and thus mess with gravitation, in an unknown way, at an exponential speed rate. Hence, it could potentially lead to the effects we call dark energy. As the conversion rate in the irreversible reaction; Eu -> 0 -> Paradise described in Fourth law of thermodynamics increases exponentially – the laws effect on energy/mass will start to become noticeable in the universe. That is, the law of conservation of energy (first law of thermodynamics) gets a new form into which energy is converted – which is; Love and intelligence. However, for this new form of energy to exist in first law of thermodynamics, the system demands Life. For the new form to become noticeable it needs life in a state that lies further into the Eu -> 0 -> Paradise process (see figure 1 over). That is, the laws effect can not be detected physically by us because the mass/energy -> love conversion rate at our intelligence level is too slow to give a noticeable effect. However, potentially we can observe the laws effect via dark energy, that is believed to cause universal expansion, instead of the expected “The big crunch“. The main point in the dark energy theory, is that the basics presented in fourth law of thermodynamics would probably disturb gravitation in an exponential manner. Therefore, the Eu -> 0 -> Paradise formula illustrated in figure 1 could actually cause the same developmental pattern we observe by looking at the universe from great distances (figure 3 under). Hence, if the logic’s in Fourth law of thermodynamics is true and the mass -> love conversion process produces dark energy, universal expansion could be the result. At least, it is an interesting observation from Head Biotech’s point of view. On that note, it is interesting to learn that astronomers led by Dr. István Szapudi of the Institute for Astronomy at the University of Hawaii at Manoa have discovered that there is an extremely rare large-scale structure in the mass distribution of the universe. In the oldest part of the universe there are huge areas of space that are of lesser density and energy, a so called gigantic “cold spot”. This is interesting to Head Biotech, because such a pattern is exactly what would be expected from Fourth law of Thermodynamics. This since, the mass/energy consumption should be exponential in the oldest parts of the universe where the first life forms evolved. These lifeforms should have been the first lifeforms that reached the exponential mass/energy -> Love/Intelligence conversion rates shown in figure 3 under (right). Figure 3. Expanding universe (left) . Fourth law of thermodynamics can explain dark energy and the expansion of the universe. The controversy in this extension to Fourth law of thermodynamics is that what causes universal expansion, really is higher evolved life. According to the theory, life on this planet has not yet reached the intelligence levels (right) which gives a noticeable effect on mass to disturb gravitation. When the conversion ratio becomes exponential in Eu -> 0 -> Paradise it could contribute to the universal expansion process by disturbing gravitation in the conversion process (left). Hence, what we could really observing in the graph (left) is other universal life forms, million and billion years ahead of us in evolution, but still governed by the same Eu -> 0 -> Paradise law. Of course, the First Law of Thermodynamics cannot be universal if Fourth Law of Thermodynamics is valid. A new form has to be added to the conservation of energy concept: Love and intelligence. Head Biotech became a complete company in 2013, with a guiding star (Eu -> 0 -> Paradise) and a plan to get there. Basically to keep a natural human population growth sustainable to ensure free competition in the future via: 1) Research in the field of Green-tech, 2) Research in the field of Molecular medicine 3) Funds to be used in cases of natural disasters, droughts etc. and 4) Further research on and the exposure of Eu -> 0 -> Paradise (Fourth law of thermodynamics). In Head Biotech’s first business model (Power Point Presentation) a peaceful solution to the brutal problem in Fourth law of thermodynamics was launched. Solution: to keep focus on the number of human individuals on the planet. If the number of individuals is naturally high, then a human controlled stiff system will lose control over natures competitive context; chaos/free competition. According to Fourth law of thermodynamics, evil is not able to control nature, if the human population on earth stays naturally high. Chaos, is sustained in nature and chaos means freedom, or free choice. Head Biotech’s business model focuses on research in the field of Green-tech and Molecular medicine. Green-tech, to prepare the planet to sustain a high number of individuals in the future. Molecular medicine, foremost personalized medicine to increase health and expected life span in poor countries. In addition Head Biotech hopes to establish a fund that will be used during natural disasters etc. (see also video menu (part 3). By using Fourth law of thermodynamics as a common logic of understanding, we are hoping to create a trustful relationship in all joints. A common understanding of why it becomes so important to keep a natural high population number on the planet. Head Biotech will be open about it’s political views based on the warnings in Fourth law of thermodynamics. Hence, we will also function as a political watch dog if something crosses the logic’s in Fourth law of thermodynamics. E.g. From experience, the stiff systems (government’s) major excuse to create its unnatural energy context (forced taxes), is to “help the weak”. To help weak individuals can be very possible without giving the money to the stiff system first. To have a percent tax, which is not payed to the government, but the tax payer himself can choose which freely based aid-company should get his/hers tax money. In this way, the energy, or money, is kept out of the governments hands. Their margins decreases – while still keeping a minimum social standard in the population. By this, the government can still make people pay taxes, but the money never reach their own hands – but into the flock of companies, which struggles to survive by helping “the weak” members of society most efficiently. A free media will, as always, play the role as watch dog over the flock of freely based aid-companies. By this, the size of the stiff system disintegrates, and comes closer to a natural energy context. Free competition is believed to filter out evil from nature, because the solutions which lower the universes energy state the most, tend to win. That is, the struggle for survival becomes the struggle to lower the universes energy state. Head Biotech’s interpretation of Nash equilibrium concludes that love wins this battle – because love lowers the universal energy state more than evil does. Hence, love accumulates over evolutionary time, while evil does not. This dynamic in the selection process for survival vanish inside a stiff system. Energy is flowing into the governmental system by force (taxes), according to the theory this will make the stiff system “a heaven for evil”. Life can be seen as the catalyst that helps the universe to overcome the “impossible” task of reaching universal ground Energy state, Eu = 0. As predicted in the theory, the increased conversion rate in the irreversible reaction, Eu -> 0 -> Paradise, is starting to close in on us. When this irreversible reaction is completed, the expression will consequently become, Eu = 0 = Paradise. By integrating this equation into Einstein’s E = MC^2 gives a hint that the final goal, Eu = 0 or Paradise, will have something to do with light. Energy and mass will vanish from Einstein’s equation, and the lights travel speed squared, is left alone (0 = 0 * C^2 -> C^2). Nash equilibrium (easy version – hard version) proves that the solutions that favor the majority of players are most likely to happen in free competition (in chaos). It proves that greed is not accumulating in the free competitive context, and can explain why life in free competition rather accumulate good, over evil (dogs, ants etc). In stiff systems the pressure to find the Nash equilibrium goes away and false Nash equilibriums can be created. However, these solutions does not need to lower the universal energy state and evil can accumulate over good, which is unnatural. The unnatural energy context inside stiff systems (too much energy) opens up for vast usage of lies compared to in free competition. According to the theory, lies is the most valued possession to evil, to be used as camouflage. Accordingly, inside stiff systems is were evil must lay its eggs to grow peacefully in the universal system. I hope I don’t step on anyone’s toes by dragging Jesus into my theory, since I have a great deal of respect for religions. My theory supports religions, since they are a product of free competition in nature and thereby wanted by the universe – since they have lowered the universes energy state. Hence, if God created this universe with it’s laws, the religions are wanted and foreseen by God, because he knew what would lower the universes energy state. However, I assume evolution to be a fact, but ironically it gives all religions support when implemented into fourth law of thermodynamics. Therefore I was glad to discover in 2012 that Jesus described hell with the same thermodynamic logics as the theory does (Markus 9:46). Jesus described hell as “a place where the flames never die”. That is, in a place with an endless supply of food/energy, Eu = ∞, which is the opposite to, Eu = 0. Since he mentioned that there would be life there as well (“and where their worm does not die”) could mean that the word “flames” is metaphoric since the worms would burn up and die in an actual flame (see discussion on youtube). 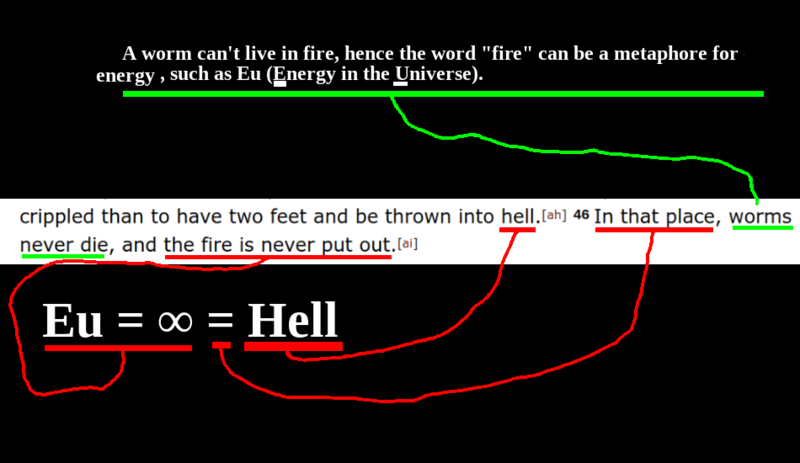 Rather, it describes a thermodynamic, or energetic context for Life (the worm) to exist in (flames = energy = food). Hence, both Jesus and Head Biotech couples Evil to the same beneficial energy context as described in Fourth law of thermodynamics. The opposite would then be Eu -> 0 -> Paradise, as in this universe. A place (system) where the flames do die out, eventually. Basically, truth wins over lies in free competition – on the whole. However, it can get ugly in free competition but the truth must come forward, and the ugliness can be seen. Inside a too much energy context (stiff system) it becomes possible to hide evil activities behind lies on a much larger scale, compared to in free competition. For example, it is possible to prolong “mistakes” and “errors” to cover evil motivations – it will not be caught up as efficiently by a stiff system, as it will in free competition. One is more flexible in how to prioritize the usage of energy and let personal interests (greed) drive the motivation, as long as it looks good from the outside. In free competition “mistakes” and “errors” are automatically quickly removed no matter how good it looks on the outside. In a stiff system, it can be covered up by a simple lie and given further life. In other words, one can say that the universal energy context forces the truth forward and genuine good behavior – as can be observed. In free competition, what is ugly – looks ugly and what is good – looks good. Free competition therefore becomes evil’s worst enemy. The further logic’s is of course, that evil’s worst enemy also is all that promotes free competition; nature, the universe itself and if you are religious; eventually what created the universe with its energy law, God. The more energy that is fed into the stiff system, the more potential to evil activities/greed due to the unnatural higher margins the players in that system experiences. Over time this system will accumulate true evil. According to the theory, true love has slowly accumulated in free competition for ca. 4 billion years. The theory argues that good moral wins over pure evil in the wild nature, due to the energy logic’s described over. Ants and dogs are good examples of selected behavior in free competition, which have never experienced evolution inside a stiff system (figures 4, 5 and 6). In general, pure evil activities is hard to come by in the wild nature, in any species – including Human. In conclusion, energy, lies and evil are part of the same world and Nash equilibrium is believed to prove it mathematically. Figure 5. 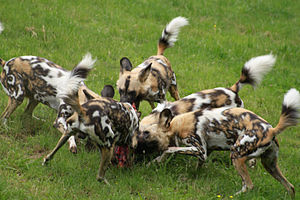 As with wild dogs, ants have never experienced another context than chaos, or free competition. They have neither developed evil features, but rather loyalty/solidarity, sharing food etc seems to be the dominating phenotypes over greed etc. According to Head Biotech’s theory Eu -> 0 -> Paradise, this is not a coincidence. (Photo credit: Wikipedia). Figure 6. This experiment from the book “A beautiful math” by Tom Siegfried shows how Nash Equilibrium is programmed into animal behavior in nature. Head Biotech claims that Nash Equilibrium explains the basic logics in Eu -> 0 -> Paradise mathematically. And that this logic is in nature due to the universe being a place with limited mass and energy. Figure 7. Suggested Head Biotech logo.The universe is known to govern things relative to if they result in a favorable universal energy state, or not. Syklohexan’s favorable conformation is the so called “Chair conformation”, The “Chair conformation” lowers the universes energy state the most (see universal energy (Eu) y-axis in figure). Hence, Cyclohexan’s chair conformation is placed in Head Biotech’s logo to illustrate Fourth law of thermodynamics important role to Head Biotech. A stiff system, is a system that is based on forced payment – such as taxes to a government. The “customer” (tax payer) has practically no choice but to pay. Hence a stiff system gets its “reward” , or energy, without the natural dynamics that takes place in free competition (chaos). The unnatural energy context inside a stiff system enables it to escape free competition, as a means to survive, in the struggle for survival. The theory states that it is in the chaotic dynamics that works in free competition, that nature filters good from evil in the struggle for survival. Further, that chaos/free competition, is linked to how the universe is created. That is, the universes desire to reach total ground state Eu -> 0 (second law of thermodynamics), which results in the competitive context seen in nature so far. Hence, chaos/free competition has been the competitive context in which all life forms on earth have been shaped, during struggle for survival for the last 4 billion years – before modern tax-based governments became possible. Inside a modern government a new thermodynamic context is introduced in nature, a constantly too much food – principle. According to Head Biotech’s theory, the outcome in the struggle for survival in this new context will gradually move away from good, towards evil. Mainly because the lie, becomes efficient in hiding the evil, which would otherwise be forced to the surface in free competition/chaos. Further, this can explain why the accumulation of evil phenotypes is removed in natural life, which struggle for survival has taken place in chaos/free competition (figures 4, 5, 6 and background picture). Traditionally, greed has been seen as natures strongest phenotype competing in free competition (chaos). Head Biotech’s theory suggests that Nash equilibrium, launched in 1951, proved it wrong. That solidarity, love, honor, honesty etc is more fit in chaos, than their opposites; greed, hate, cowardice, lies etc. Hence, these features will accumulate in nature. This is the reason why we can not observe pure evil in nature after 4 billion years of struggle in free competition/chaos, because it is considered weak in nature/universe. By applying Nash equilibrium, chaos/free competition, is the very mechanism that hinders evil’s progression over good. Then comes the crucial point, chaos/free competition originates from how the universe was created, with limited mass/energy and gravitation. Hence, if Nash equilibrium proves that evil is filtered out during struggle for survival in chaos/free competition, the universe is programmed to accumulate love via life in the universe – on the whole. The universe guarantees by this that emerging intelligence in the universe will not be dominated by evil features but by good – on the whole. Those that benefits from this law are the ones that lives and thrives in free competition – this includes the worlds poor as well as the rich (rich via capitalism). Via Fourth law of thermodynamics they have become in particular valuable to nature, and should according to the theory be “stripped” from evil – since they never have experienced another context than the too little food – principle (much like the ants example). Ironically, fourth law of thermodynamics blesses the super-rich (our potential clients) along with the the super-poor and thereby brings them together via Head Biotech’s Fourth law of thermodynamics. To Head Biotech, the two groups belong to the same “pack” as seen by nature, the universe and eventually by God (if you believe in God) – due to Eu -> 0 (second law of thermodynamics). Traditionally, the super-rich and the super-poor have a tendency to be placed on two opposite poles in the moral and political landscape. However, this view originates from humans and can not be declared as the truth. Secondly, our potential clients can by this also help the universe in its struggle to reach Eu = 0, or to reach paradise, as Head Biotech sees it. 5.1 The theory couples chaos/free competition with universal thermodynamics: We know that the universe seeks its lowest energy state(s), Eu -> 0. 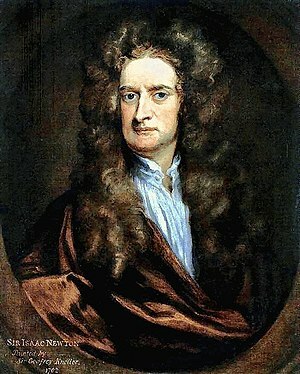 We can see this by observing that all planets are round (gravitation), in chemistry etc. The theory introduces a new dimension in which the universe can “feel” universal energy states – the difference between evil and good in life. This universal intervention can explain Adams Smith’s vision of “God’s invisible hand”, from 1776. That “God’s invisible hand” really is caused by a functional universal law, described in Head Biotech’s Fourth law of thermodynamics. According to the theory, that the universe always seek its total ground state, Eu = 0, will guarantee truth, love and intelligence to be coupled together and to accumulate over time. Based on this, the theory states that the true prime mover in the battle between good and evil in nature, is energy context. Head Biotech dares to suggest, that the very reason behind why the universe was created with limited energy/mass and gravitation, was for it to be converted into paradise. Interestingly, Jesus says the same thing in Markus 9:46 (48) (see more under: 4. Other developments since 2011). 5.2 Our universes ultimate goal, Eu = 0, and its interpretation by Fourth law of thermodynamics: The constant struggle during evolution to lower the universes energy state, relative to Eu = 0, in chaos/free competition has steadily accumulated love, instead of evil. Consequently, the vision and desire to reach paradise in us have been shaped by the universe itself, via the constant universal struggle: Eu -> 0. One can say that the universe itself has produced the vision of paradise, indirectly via its desire to seek lowest energy state, Eu -> 0. That is, this universal energy law has set the stage for how evolving life have been shaped, via the limited amount of food principle, which again is coupled to free competition/chaos. Nash equilibrium describes the magic that takes place in free competition/chaos mathematically. The magic that guarantees love to accumulate over evil in chaos, the magic in which Adam Smith referred to as “God’s hand”. The theory concludes that the universes ultimate physical goal, Eu -> 0, correlates with love’s ultimate goal, expressed by humans as; Paradise. The whole purpose with the universe should therefore be for life to find paradise, which correlates with the universes ground energy state, E = 0. In a way life becomes the catalyst the universe needs to propel itself to its ultimate desire, to reach Eu = 0. This pattern should boil down to the universal irreversible reaction; Eu -> 0 -> Paradise. Consequently, this irreversible reaction will end in the thermodynamic state; Eu = 0 = Paradise. Hence, two goals are met in this thermodynamic state, the physical universe final rest, and our mental vision of paradise. Since both worlds ultimate goals has been reached at Eu = 0 = Paradise, no more energy should be required. Time, as we know it, should therefore stop. See also direct links in the text.